The site of the Giant Powder Company is within the present boundaries of the Point Pinole Regional Shoreline. 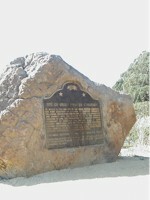 The official marker plaque is located behind the flagpole near the main parking lot. Some ruins, such as old building foundations are visable at various locations in the 2,300 acre park. Pt. Pinole is the last site of the Giant Powder Company, the first company in America to produce dynamite. Following devistating explosions at their San Francisco and Berkeley sites, the business moved to this location in 1892. Incorporating the established Croation community of Sobrento, the company town of Giant quickly grew into one of the North Bay's industrial centers. Explosives were produced here until 1960 and were essential to mining, dam building, and other construction projects throughout the Western Hemishpere.